Coming soon to Manassas, VA - Brand new townhomes in a highly anticipated, amenity-filled community! Blackburn will feature 2-car garage townhomes close to commuter routes, shopping, dining, and more! Affordable, New Townhomes If you've been waiting for new construction in the area, this is where you need to be! Newly designed floorplans and gorgeous brick exteriors are designed for the way you live. Finally have the space you've been craving with bright, open layouts and a gourmet kitchen with 3-4 bedrooms and 2.5+ bathrooms! Pricing will start in the upper $300s, and many loan options will be available. You can even put as little as 0% down! Future Amenities -Pool with Clubhouse for hanging out, hosting parties, BBQ's and more! -Fitness Center - ditch your gym membership! -Tot lot for little ones to play Convenient Location Blackburn is located in a convenient, commuter location less than 2 miles to the I-66 ramp and the Prince William Parkway! Shopping, dining, and entertainment are all within a few minutes of the community: -Home Depot, Kohl's, Duluth Trading Company, Old Navy, Regal Cinemas -Bull Run Plaza with Best Buy, Ross, Starbucks, Chick-fil-A, PetSmart, Michaels, Shoppers Food, Ulta Beauty and more! The Virginia Gateway Shopping center in Gainesville is also a short 10-minute drive -Enjoy the weekends at 2 Silos Brewing Company and The Winery at Bull Run - both only 4 miles away! 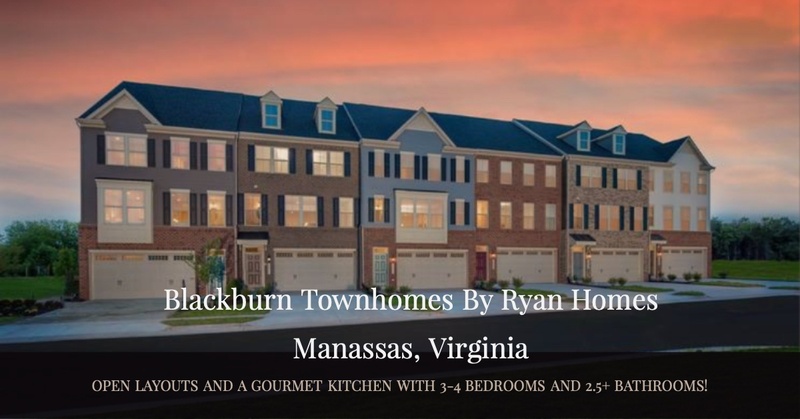 BlackburnTownhomes is a rare opportunity to have it all in Prince William County. Call Mary Palma at 571-259-3009 and she will gladly schedule your appointment with Ryan Homes to look at available lot options and floor plans. These homes are selling fast.